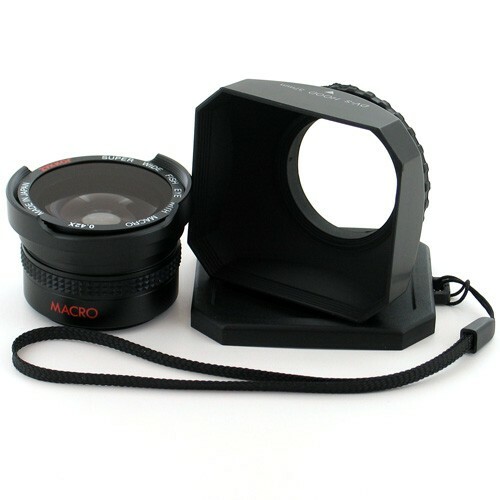 This unique lens and hood combination works on ALL Cameras & Camcorders with 37 mm size Lens Filter thread!!! 0.42x High Definition Professional Wide Angle Panoramic (Panoramic, wide pictures) Fisheye Lens with "MACRO" for (close up pictures).It fits right over your camera's existing lens system and affects the full zoom range of your camera's lens. A wide-angle converter MORE THAN DOUBLES your angle of view, allowing you to get twice as much in the picture, include more of the landscape, include more people in group picture, and interiors show more of the room. Your telephoto setting also becomes wider, this converter brings everything closer. The robust lens hoods of the DV series are specifically designed for the permanent use on digital video cameras, to protect the exposed and sensitive lenses of video cameras from mechanical damage. The angles of these rectangular hoods match with the shooting angles of digital video cameras. DV series lens hoods are also provided with an additional protective cap, which can be put on front of the hood. The main function of the lens hood is to shade the lens from stray light, improving your contrast and image quality. But it will also protects the front barrel from the inevitable impacts against walls, door frames, and other real-life obstacles and in inclement weather, it can assist in keeping moisture or wind-blown debris off the lens. This hood enables you to shoot even towards the light source (in bright sunlight) without excessive flare, as long as you keep the light source outside the image area. Attach the hood by screwing it on the filter or lens thread. Rotate lock-ring back to fix the hood on the thread. While fixating the hood with the lock-ring, keep the "V" symbol on the hood exactly at 12 o'clock position. © 2010 Zykkor USA. All Rights Reserved.